But first I got there 30 minutes early and enjoyed her garden patio overlooking Lake Washington and the Cascade Mountains with my book and a glass of wine…heaven?!? Then we got down to business. I will say that I again learned a lot from this class, with particular interest in making the tomato sauce and bechamel sauce for the cannelloni. I will say that this is a cuisine that though I like it, it is the hardest one to overcome some of anxieties with all of the cheese, butter, oil, and carbs. I don’t think I am alone in this but I feel alone in this as everyone else in the world I know just looooooves Italian food. I will also say, although I would probably be shot for this, that Italian food is not one of the more complex or difficult cuisines to master…but I’m sure others could prove me wrong. 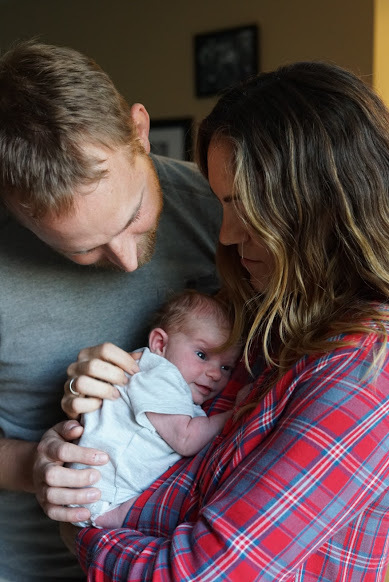 But it is a cuisine I would like to get better at and cook more of, mostly because I know so many (Bryan) that would love it if I did. We started on the dessert this time because it is similar to an ice cream dessert that needs to freeze. This was actually probably my favorite dish of the night and I would definitely make it again. A biscuit torton takes those little amaretti cookies and crushes them into crumbs and soaks the crumbs in cream. After those crumbs have soaked up a lot of the cream we beat more cold heavy cream by hand to form soft peaks. We then added vanilla, rum!, and sugar to the cream and then folded this into the amaretti cream. You then pour the mixture into foil lined muffin tins, top with slivered roasted almonds and one candied cherry and set in the freezer. 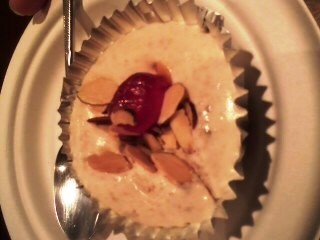 The end product is a silky smooth ice cream with the flavors of rum and almond which is just divine. Perfect little portions to for a dinner party. Biscuit torton was super creamy and yummy. We next began on our tomato sauce. I was excited for this and was very happy with how simple it was to make. She told us about the can of tomatoes to look for, the Nina whole pear tomatoes you can find on Amazon, and also informed us that cooking a sauce all day is not necessary and cooking too long can actually turn the sauce acidic. It was your basic garlic, oregano, basil, parsley, onion, celery, olive oil and tomato paste. We tore the whole tomatoes with our hands before adding to the sauce. I also learned tonight that I like a little deeper and darker tomato sauce and for me I would just add more tomato paste to the sauce. We then set the sauce aside and let simmer for about an hour. We then made our bechamel. Very similar to the bechamel sauce we made last week but this one was more simple; just flour, butter, milk, nutmeg, salt and white pepper, no cheese or eggs this time. I like making these white sauces…and I love the hint of nutmeg. 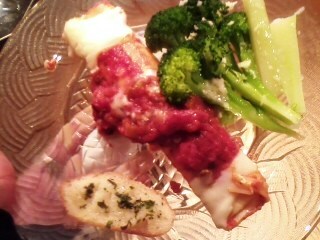 My first tiny wedge of garlic bread, I like the crust, cannelloni, and broccoli. Next we made our filling for the cannelloni using Calabro whole milk ricotta, which she preached about, fresh mozzarella, parsley, a bit of prosciutto, nutmeg, and eggs. We each took turns rolling the squares of precooked and cooled pasta squares with the filling. The casserole dish was lined with our tomato sauce, then topped with our cannelloni, then a layer of the bechamel, before being topped with the rest of the tomato sauce. We set this aside to make our garlic bread and broccoli. The broccoli parmesan was very tasty and easy. We parboiled broccoli in salted water and then chilled. In the casserole pan we coated the bottom and sides with butter, we attractively arranged our broccoli florets in the pan before pouring melted butter and a good dose of grated parmesan on top. The garlic bread was also straight forward. The bread, cannelloni and broccoli all baked in the oven for 30 minutes so she is right that this would be a great entertaining meal, easy to prep even a day ahead of time, and simply bake all at once. We then finished our prep with the antipasto trays. I LOVE antipasto. This is one thing I think the Italians are genius about. I love tastes of many things and this is such a great way to do that and not ruin your appetite. We wrapped thin prociutto around very sweet honeydew melon. We rolled spicy salami and diced mortadella and imported provolone and stuck them all with toothpicks. We filled a dish with black and green olives. 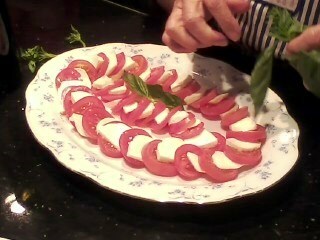 We made a caprese with sliced tomatoes, fresh mozzarella, julienned basil and a dose of olive oil. And we filled a bowl with those little Italian breadsticks. She gave us a lot of other additional antipasto ideas as well and where to get them all. I demolished the antipasto. I particularly loved the prosciutto melon and surprisingly the mortadella. 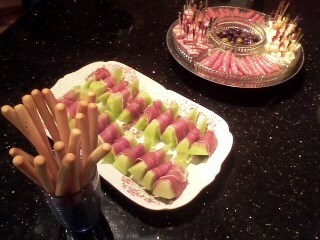 Proscuitto melon, breadsticks, and meat, olive and cheese tray. I did really enjoy our Italian favorites class and am looking forward to making my own sauce in the near future for something. I would also like to make the cannelloni again but I would be interested in trying either a meat or squash filling some time. We still have two Italian classes left; a pasta making class and a Northern Italian class.